Don't you love the smell of cinnamon coming from the oven? Lazy Sunday mornings, coffee, tea and a warm cinnamon treat for breakfast. Sure, cinnamon rolls are amazing but I had something a little lighter and easier in mind. 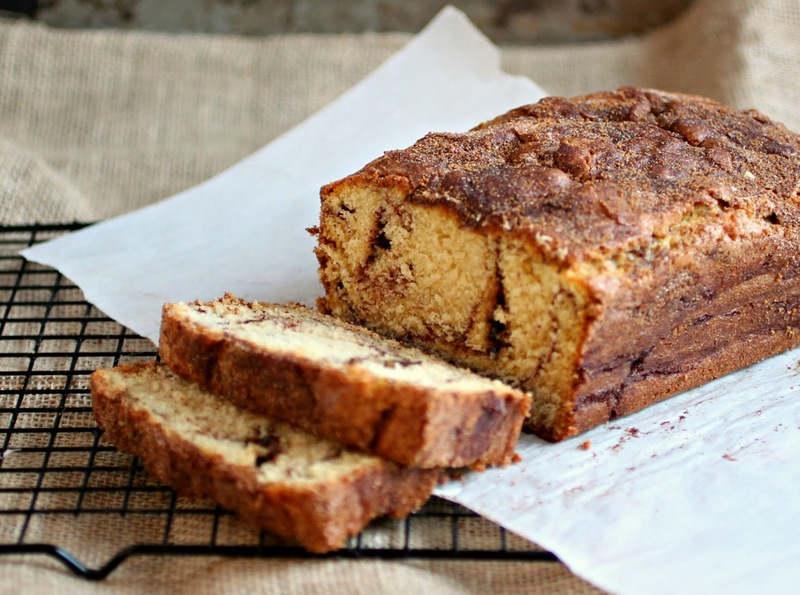 Sweet quick breads are so easy to make and this one delivers on that delicious Sunday morning aroma and is packed with wonderful cinnamon flavor. The top layer of cinnamon sugar gets a slight crunch in the oven for an extra treat. And now, we're ready to get our Sunday started. 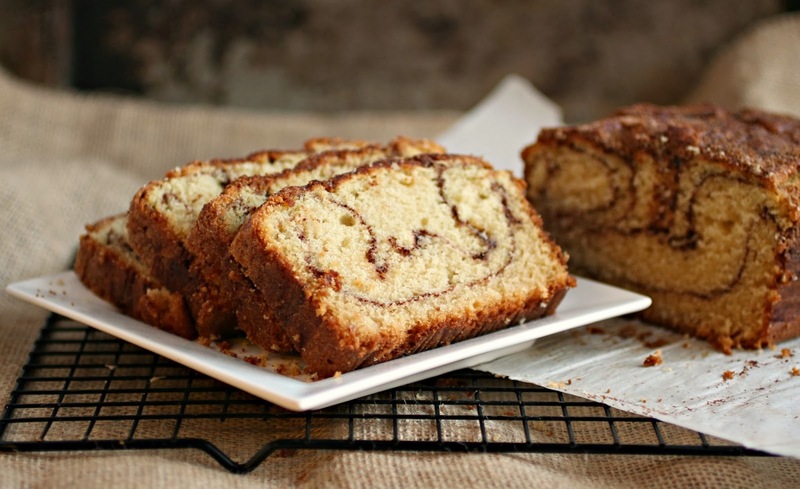 Or, even better, maybe we'll just take our coffee and cinnamon bread and go back to bed. Enjoy! Add the egg and sugar to a large mixing bowl and beat together using a stand or hand mixer. Beat in the butter then add the vanilla and buttermilk and continue beating until everything is well mixed. In a separate bowl, sift together the flour, baking soda and salt. Slowly mix the dry ingredients into the wet batter. Combine the light brown sugar and cinnamon in a small bowl and set aside. Butter and flour a loaf pan (I also placed a sheet of parchment paper in there for easy removal) and pour in half the batter. Sprinkle on half the cinnamon sugar mixture and top with the remaining batter. Using a butter knife, very gently swirl the dough, just a couple of times. Top with the remaining cinnamon sugar and bake in a pre-heated 350 degree oven for 50 - 60 minutes or until a cake tester comes out clean. Makes approximately 10 servings. I think I could take down a one of these loaves myself and while I loved the version I made and I like yours better. No rising and no dealing with yeasty dough! mmmm cinnamon=breakfast. This bread looks so delicious and I can practically smeeeelll how amazing it is! I really want to get good at baking with yeast. However, this little lovely wil make me happy, happy, happy! Ahhhh yes, now we are talking!! Looks awesome! 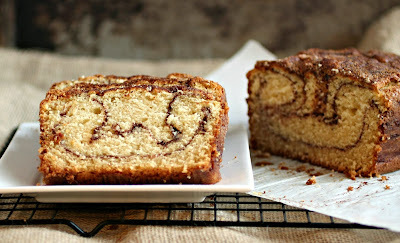 Imagining biting through that top coating of cinnamon crunch... :) This looks wonderful, Anita. Oh yummy! Did you mention what size loaf pan you used? Hi Shari, I just used a standard 9x5 loaf pan. Lovely! Do you have a sense of how long this will keep? I'm hoping this is recipe that will travel. It was raining when I got up this morning--thunder and lightning and all. Just the morning for a special treat. I doubled the recipe (I have 7 kids), used whole wheat flour, cut the sugar by half (because I always cut the sugar by half), and baked it as a cake in one of my extra-large lasagne pans. Kids inhaled every crumb!!!! Thanks for the inspiration today. Why yes, I do love the smell of cinnamon coming from the oven. I would also love to have this bread with my morning coffee or perhaps as a mid-afternoon snack. I can practically smell how amazing this is just by looking at these gorgeous photos. 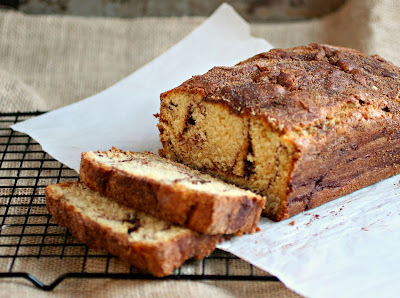 I love quick breads like this. They're the perfect everyday snack. I gotta make this asap! I tried it today and it's sooooo yummy! Love the cinnamon taste! I double the ingredients for two loafs the one for present!! Although got a bit darker I was very generous with cinnamon and brown sugar the taste sooooo delicious! Thanks for the recipe it's so easy to make.